Based in New York and Beijng, Lily & Honglei work as an artist collective. Utilizing traditional painting and animation, as well as new media such as virtual reality and augmented reality, Lily & Honglei create ‘visual fables’ intertwining current social issues with cultural heritages. Lily & Honglei’s artworks have been presented at numerous prestigious international and national venues, including Museum of Art and Design in New York, Queens Museum of Art in New York, Whitney Museum of American Art in New York, Arad Art Museum in Romania, Musée Guimet in Paris, He Xiangning Art Museum in China, Museum of Ara Pacis in Rome, Institute of Contemporary Art Boston, The Painting Center of New York, Eyebeam Art Technology Center New York, Jamaica Center for Arts & Learning in New York, Australian Center of Virtual Art in Sydney, TEKS–Trondheim Electronic Arts Centre in Norway, Electronic Visualization & Arts at British Computer Society in London, ISEA–Intel Society of Electronic Arts in Istanbul, New York Artist Residency Studios Foundation Gallery, Shanghai University Gallery in China, Center for Advanced Visual Studies at Massachusetts Institute of Technology, Center for Contemporary Art Foundation Kiev in Ukraine, University Gallery of University of Massachusetts Dartmouth, Axiom Gallery Boston, NurtureArt Gallery in New York, Devotion Art Space in New York, SIGGRAPH Art Gallery 2008 in CA, SIGGRAPH Asia 2013 in Hong Kong, Budapest Short Film Festival in Hungary, Color Out of Place Festival in UK, Dumbo Art Festival in New York, International Festival of Electronic Art 404 in Argentina, MICROWAVE International New Media Arts Festival 2009 in Hong Kong Heritage Discovery Center, FILE-Electronic Language International Festival in Brazil, Zero1 Biennial of New Media Art in San Jose CA, among many others. Their recent project Shadow Play: Tales of Urbanization of China has been included in the Rose Goldsen Archive of New Media Art at Cornell University. "Underwater" Porformance organized by Daniel Shanks, conducted by Jade Sharkfin, Jolene Sabetha, Kai Serapis. [url=http://dslcybermoca.net]DSL Cyber MoCA [/url]is pleased to announce: The museum of contemporary art in Second Life will be unveiled by the exhibition "TransForm," April 30 through July 20, 2009 (closing reception date and location will be announced in June). As part of the 10th Boston Cyberarts Festival, the exhibition will be on view in both physical space, Design Gallery at University of Massachusetts Dartmouth, MA, and the newly launched DSL Cyber MoCA located in the international artist community in Second Life. The exhibition is curated by DSL Cyber MoCA's founders and leading artists Lily & Honglei and virtual reality philosopher Philip Zhai, sponsored by DSL Collection of Chinese contemporary art, Visual Design Department of College of Visual and Performing Arts, University of Massachusetts Dartmouth. The exhibition focuses on the signification of "trans-" (transitional, transcending, translating, transforming, etc.) and "form" (traditional and emerging forms of art), examines the ever-changing meaning of aesthetics in the digital era over extensive areas: the social, cultural, or personal. It explores ways of using Online virtual world as the "agent" to transform traditional art forms, such as painting, sculpture, folk art, performance, into digital arts in Cyberspace, and therefore argues that virtual-world art, as a new language, is proceeding to continue the development and "transformation" of expressions that constitute the content of the history of art. The exhibition also serves to introduce a culturally meaningful collection of contemporary Chinese art, DSL Collection, to the global artist communities connected by Second Life, meanwhile, introducing several artists and artist collectives actively contributing to the theory and practice of virtual world art and new media media art to Chinese audience. [b]Philip Zhai[/b]: Digital Paintings; DSL Cyber MoCA theme music. In Second Life: DSL Cyber MoCA. (Teleport with the link Link: http://slurl.com/secondlife/Uqbar/184/171/21/, or read [url=http://dslcybermoca.net/moca_instruction.htm]Instruction[/url]). Group exhibition will be on view from April 30th to July 20th, 2009. Permanent display: DSL Collection of Chinese contemporary art. Honglei and Lily are two important contemporary artists of our generation who represent the future direction of contemporary mixed media and multi-media arts for our time. They bring a refreshing vision to the ‘repetitive’ and at times stagnant place of the ’status quo’ commonly seen in the mainstream. Their work though underexposed, currently burns it’s way into the consciousness, consciences and thick fabric of the most complex and cutting edge conversation that our generation is currently engaged and yearn to participate with more authenticity as they ongoingly interact and learn to clarify issues. We as a society more than ever -who struggle to reconcile differences, artificial and real; which now unquestionably exist in both eastern and western and southern aesthetics. Thus Honglei and Lily’s work will in time, impact the transformation of our current socio cultural consciousness on a global scale for this generation and the one to come not too long from now. Professor of Drawing and Painting. May 19, 2009; 7:00 pm to 9:00 pm. Massachusetts College of Art and Design, Studio for Interrelated Media, North 181, Evans Way (off 621 Huntington Ave) Boston. DSL Cyber MoCA will officially open in Second Life on April 30, 2009.Public (all Second Life users) can access to a comprehensive collection of contemporary Chinese art from DSL Collection, meanwhile, experience the unconventional virtual museum, an original multimedia piece with metaphorical and meditating environment created by Beijing artists Lily & Honglei (杨熙瑛，李宏磊). We would like to extend our warmest invitation to the artist communities in both Second Life and the "real life". DSL Cyber MoCA is a collaboration of DSL Collection of Contemporary Chinese Art and new media artist team from Beijing - Lily & Honglei (杨熙瑛，李宏磊）. - Developing highly interactive online exhibitions of contemporary art by employing imaging technologies of virtual world (Second Life) platform. - Promoting creativity and diverse cultural expressions in Cyberspace through art projects, showcases and cross-continent artist collaborations. - Contributing to artist community building, education and cultural exchanges by using the communication function of virtual world platform. 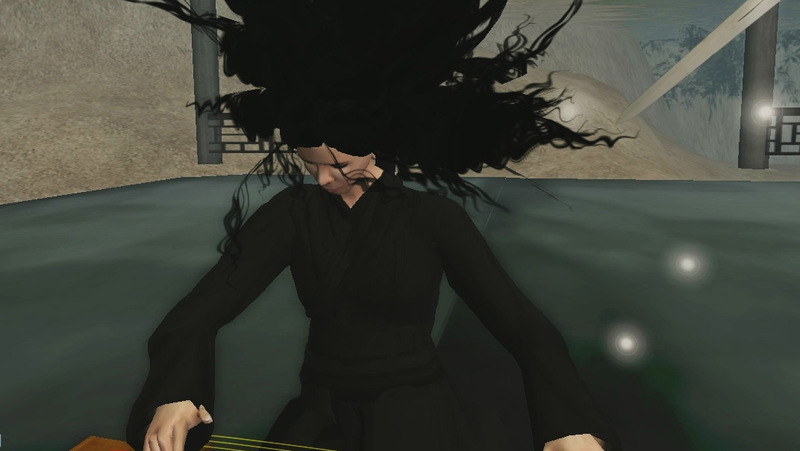 Based on an original art project, "Land of Illusion" in Second Life by Lily & Honglei, the virtual constructions of DSL Cyber MoCA is unique for its metaphorical and aesthetic approaches, and considered a piece of independent artwork by itself, while constituting a comprehensive collection of Chinese contemporary art - DSL Collection. DSL Collection represents 90 of the leading Chinese avant-garde artists who have a major influence on the development of contemporary art in China today. It was started from a museum approach, which means that we are collecting a wide range of media including painting, sculpture, installation, video, and photography. We want to share the experience of contemporary culture and to make it more accessible and meaningful for a broader public. DSL Collection participates in conferences, seminars, and talks hosted by institutions or at special events. The DSL Collection has participated in seminar at Tsinghua and Shanghai Universities, and been scheduled for a seminar at ARCO Madrid 2009 and a lecture at New York University. Lily & Honglei (杨熙瑛, 李宏磊）, the artist team from Beijing, initiated the Cyber Museum of Contemporary Art based on their art project "Land of Illusion（太虚幻境)" constructed in Second Life with virtual traditional Chinese architecture, where Lily & Honglei have created a series of virtual installations, multimedia presentations and online performances accomplished through cross-continent artist collaborations since 2007. It is a cultural meditation engaging history, philosophy as well as Chinese diaspora. The work examines the current economic development of China within the context of globalization, while simultaneously exploring the meaning of virtual online communities in terms of global dialogues as they relate to cultural roots and the fantasy of China. "Land of Illusion" also functions as a net-art platform aiming to fulfill the promise that the Internet is the direct continuation of Enlightenment thought, namely promoting cultural openness, decentralization and independent thinking. As Chinese contemporary artists, Lily & Honglei consider that these aspects are extremely relevant to art-making. Lily & Honglei's work is intended to make social and cultural commentaries about virtual worlds, particularly through reinterpreting themes in Chinese folklore. The work reflects on globalization's impact on the environment and on the individual, which often results in multi-layered cultural or personal identity. It explores displacement and the spiritually homeless who struggle to preserve traditional values. More importantly, "Land of Illusion" is a virtual world art project that proposes solutions for preserving and re-evaluating cultural heritage with digital arts, and developing aesthetic traditions with new imaging techniques in the 21st century.